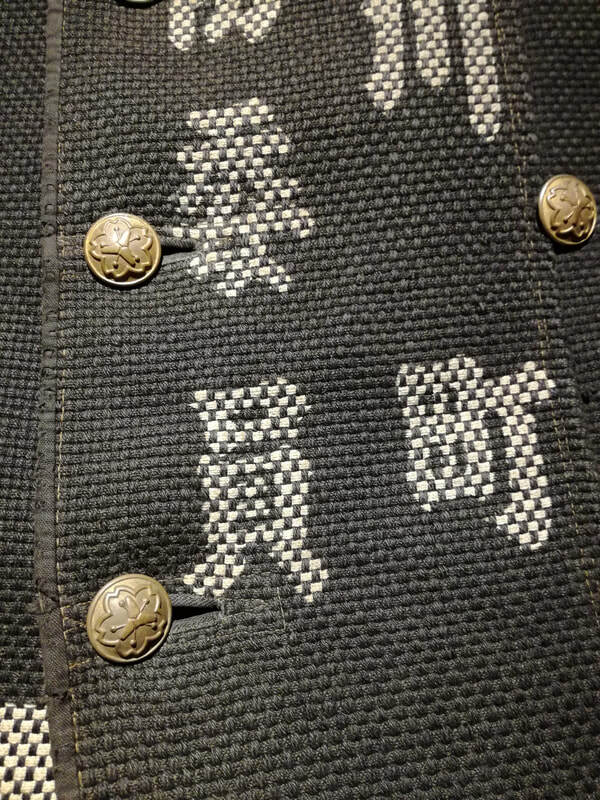 Greetings for 2019 fellow sashikoists! This is just a short post to say hello before January gets away from me. 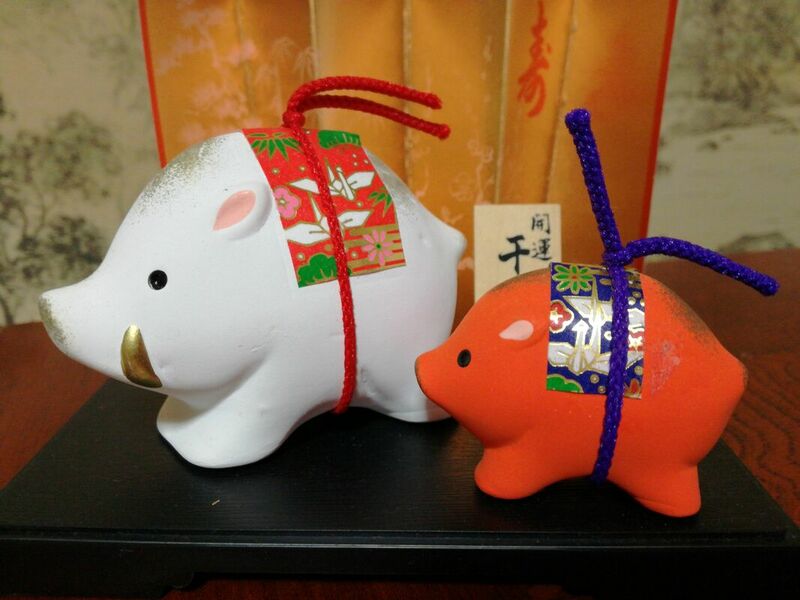 In the Chinese zodiac calendar it is the Year of the Boar, and I am seeing reminders of this everywhere in daily life, on calendars, New Year cards, at the local shrines and temples. People are believed to take on the character of the animal of their birth year, which is supposed to be a special one when it comes around. Boars are said to be sincere, hardworking, have a healthy ego, and make confident and reliable leaders. With two boars in my immediate family, I can say there is some truth in that! Below is the character for boar. 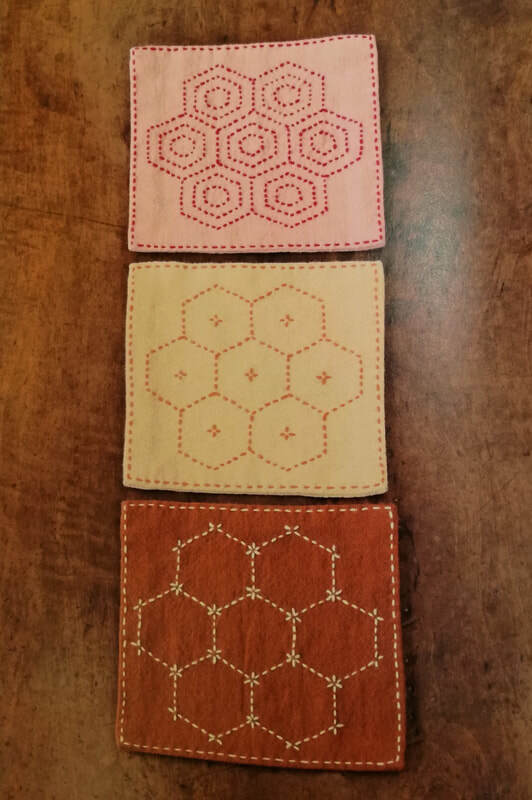 ​For those of you already familiar with sashiko techniques, who are able to decipher diagrams and know how to sew up the pieces, why not try making a coaster? An ideal size when completed is 13 cm by 13 cm. 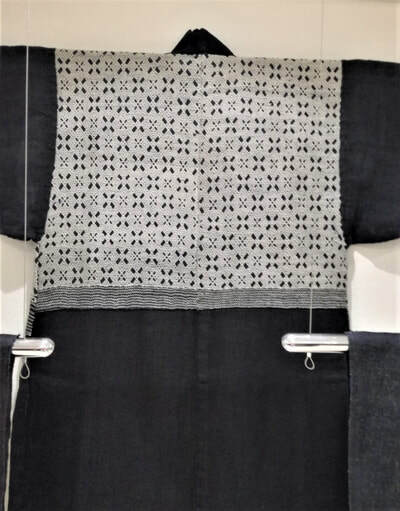 Enlarge the design, transfer to the cloth and stitch the sashiko through one layer. 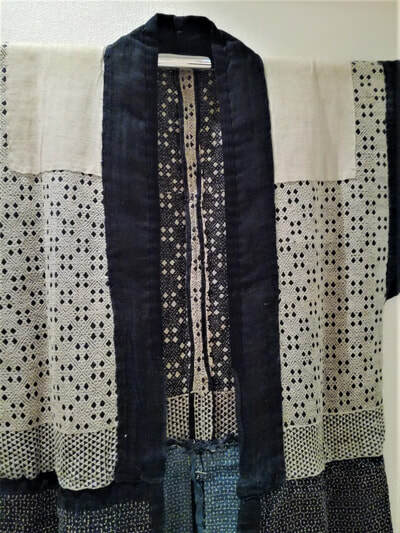 Then apply adhesive backing, fold over right side in and sew up the borders (leaving a gap to turn right side out again). Sew up the gap and you’re done. Good luck! I’d be thrilled to hear from anyone who tries it. 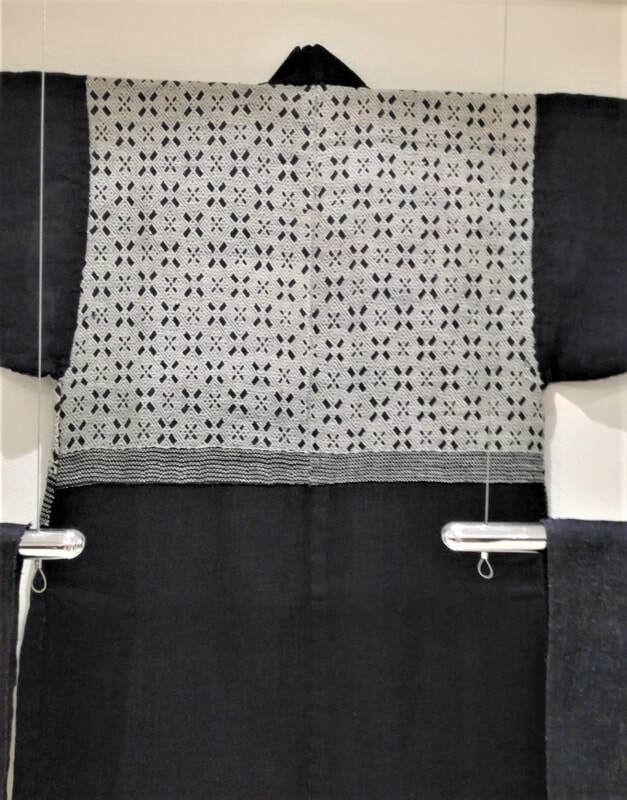 Wishing you all the best in your adventures with sashiko this year. 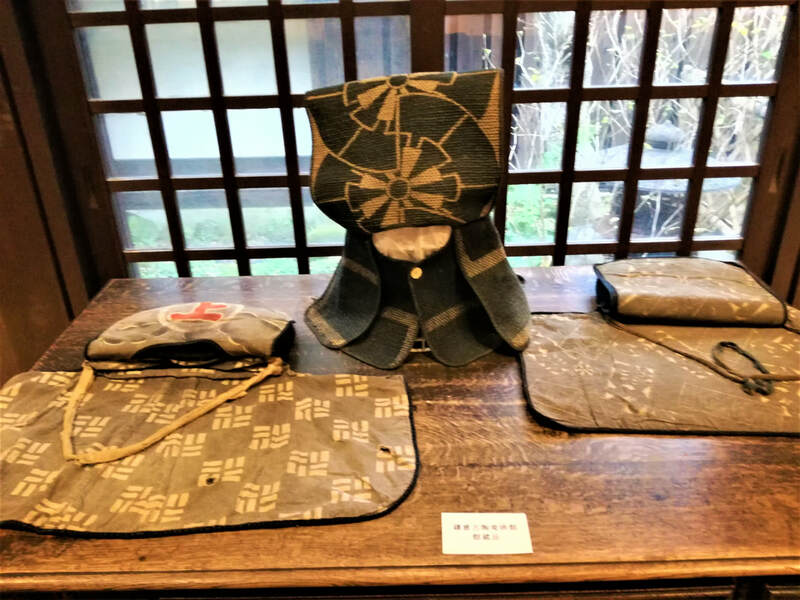 After my recent visit to the Kogin sashiko exhibition in Asakusa, I decided to take a closer look at books about koginsashi. To tell the truth I haven’t paid them close attention before now as I don’t do koginsashi, myself, but my interest was piqued. 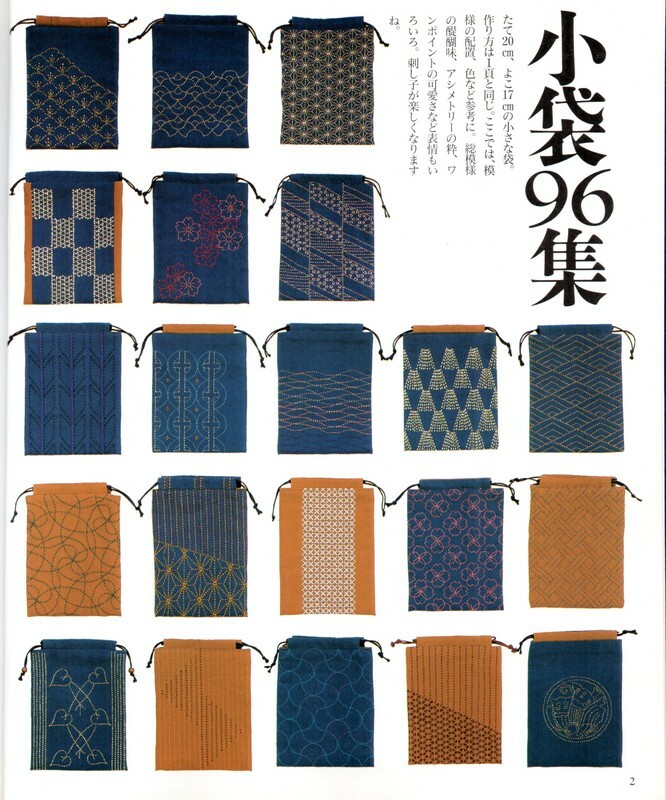 I started wondering why the type of sashiko that I do and kogin are so radically different. 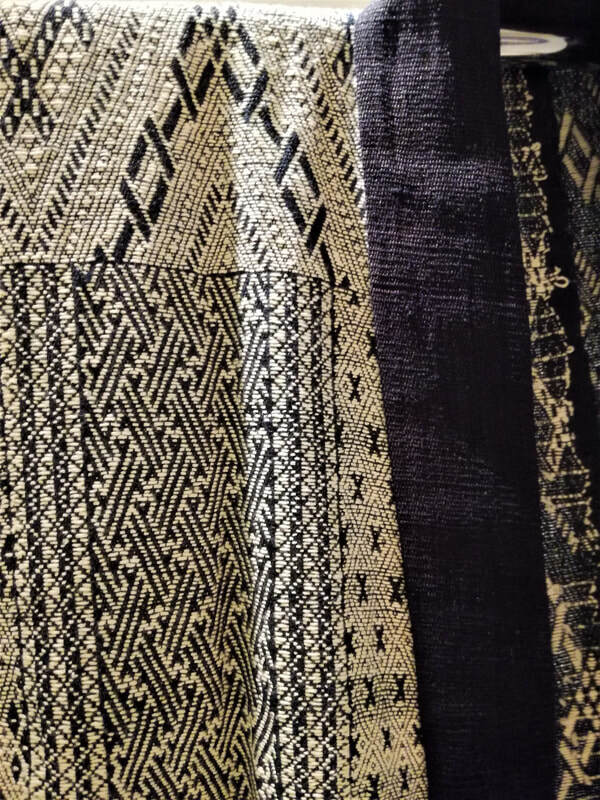 So I turned to my sashiko bible (Sashiko no Kenkyu, Kikue Tokunaga), where I learned that kogin techniques developed as a method of using thick thread to close up the gaps in coarsely woven hemp, the only type of fabric available, whereas sashiko developed from the need to stitch rags together and make layers from them, then stitch over to hold them in place. Hence the kinds of patterns that evolved as a result of these two differences are markedly distinct. 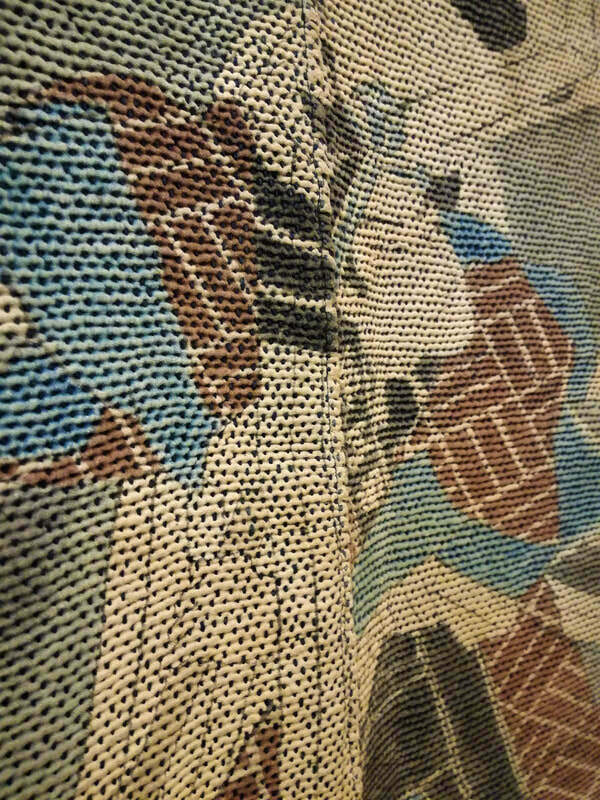 Koginsashi patterns are always composed of straight lines because the stitching follows the weave of the fabric, and though there are many patterns they are all uniform. 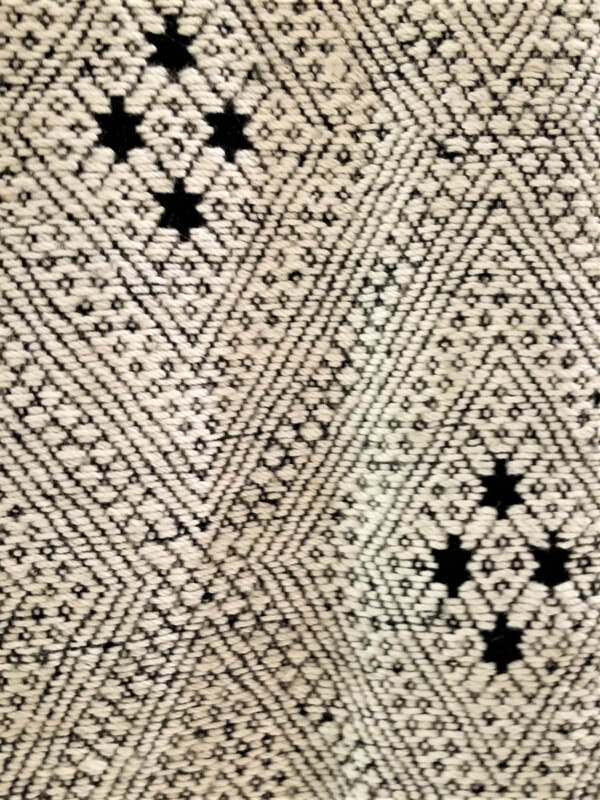 The sashiko patterns that evolved in the Yamagata and Akita area, however, did not have such constraints, patterns have curved lines, and there tended to be more variations and original designs. 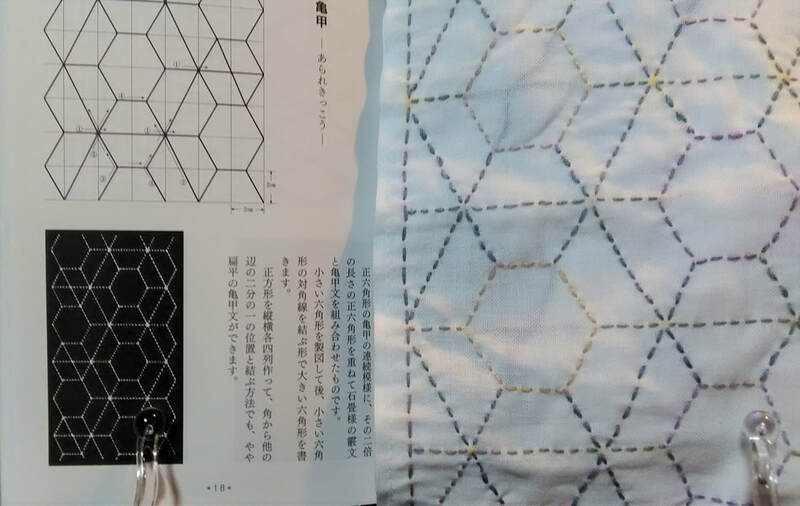 ​The author Hisako Kamata was born in Aomori prefecture, the home of Tsugaru kogin, which is traditionally blue and white, but in this book she introduces a fresh perspective through the use of colour. 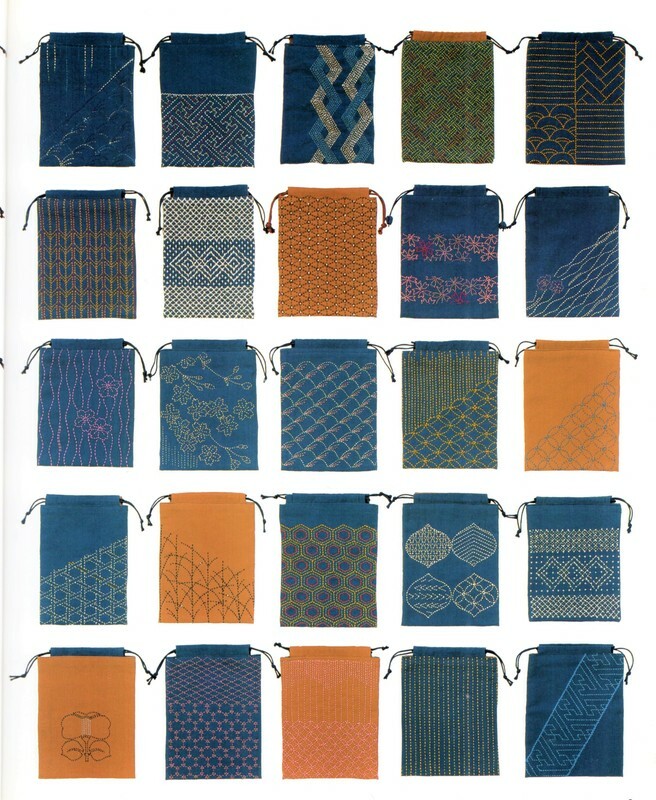 She shows how to make useful items for daily life such as a cushion, pencil case, coasters, and purses. 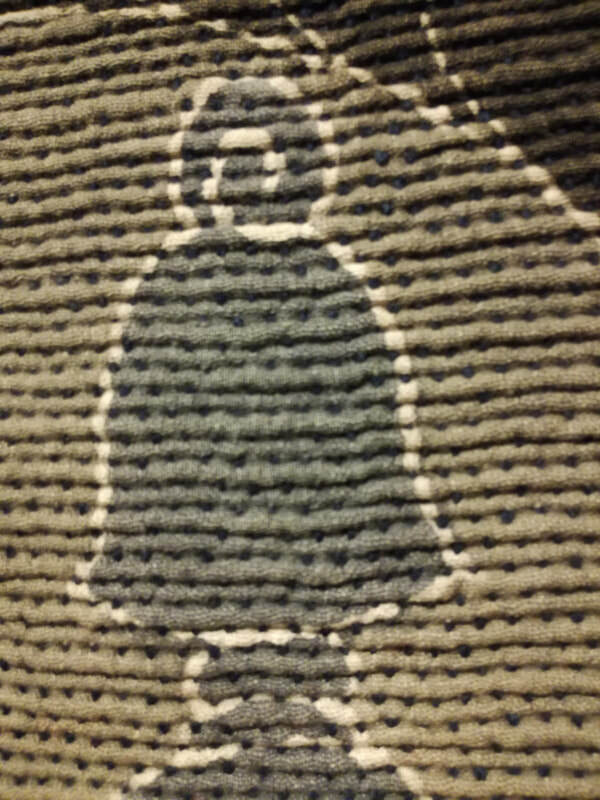 ​I was very taken with a cushion in different shades of green. You can see some of the examples by using the “Look Inside” function on the Amazon site. 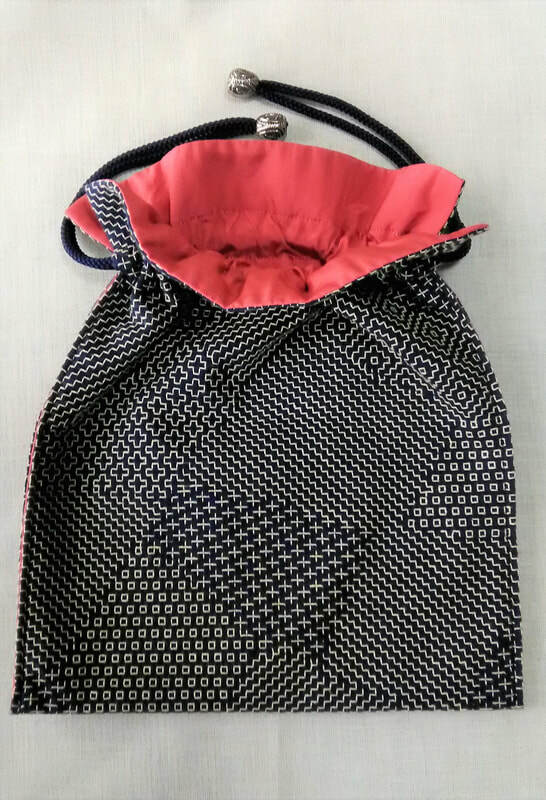 The one review on the Amazon site gives the book high praise and says that basic techniques are explained in detail through photographs that make it suitable for beginners or anyone who is not expert at sewing. 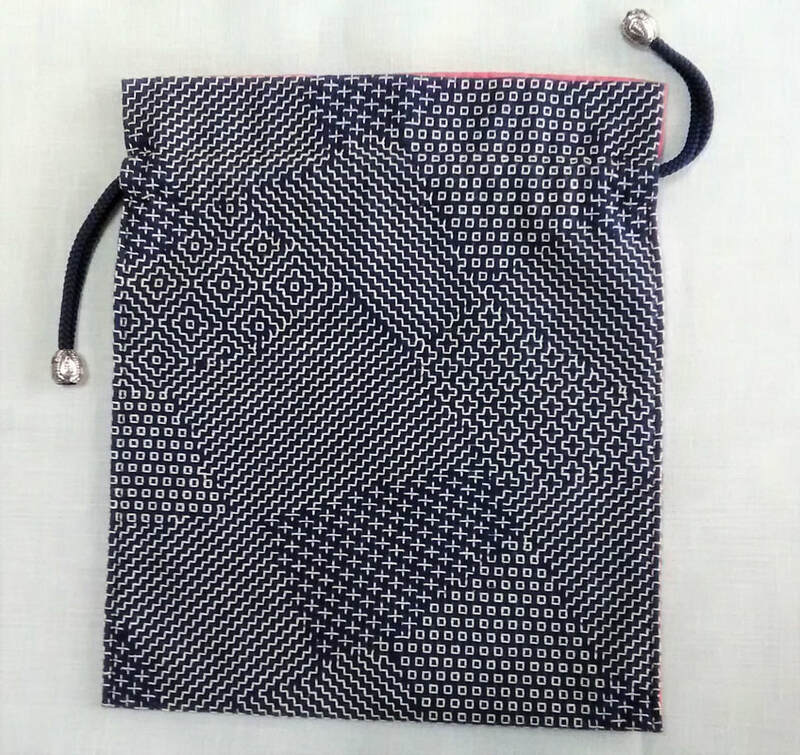 This book came about as a the result of a collaboration by Yoko Tsukamatsu, who has a tote bag business and Rika Fukuda, a sweets researcher with an interest in folk arts. 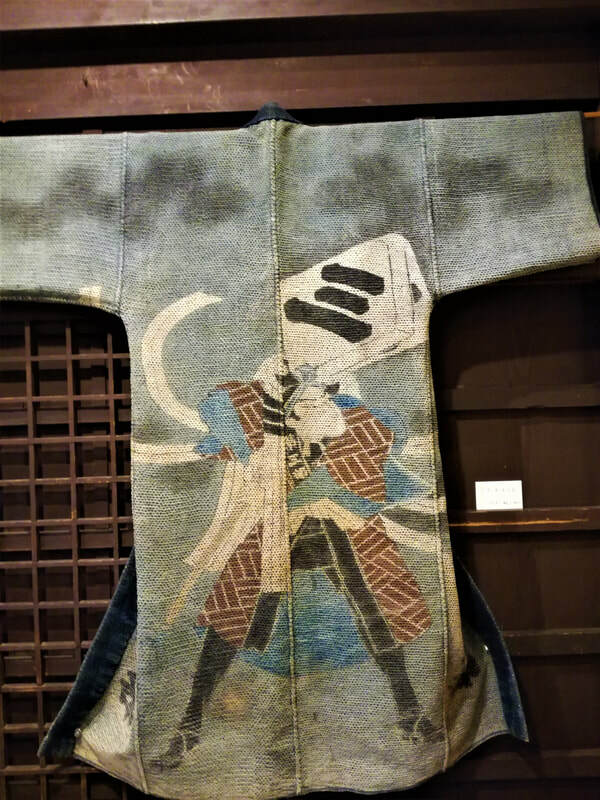 Together they established the Nunogeiten Project (Fabric art exhibition), and hold exhibitions of fabric items based mainly around koginsashi. 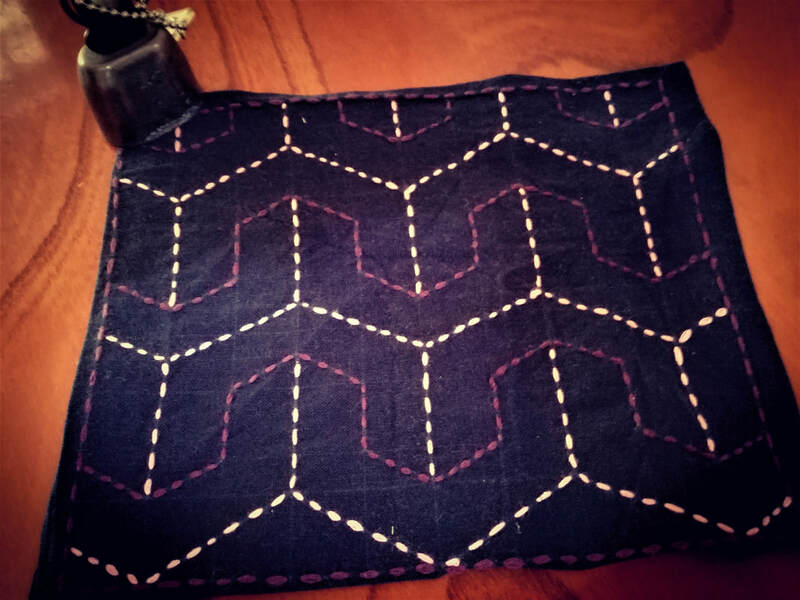 Like many books this one introduces basic techniques and several patterns, but what really sets it apart is the stylishness. 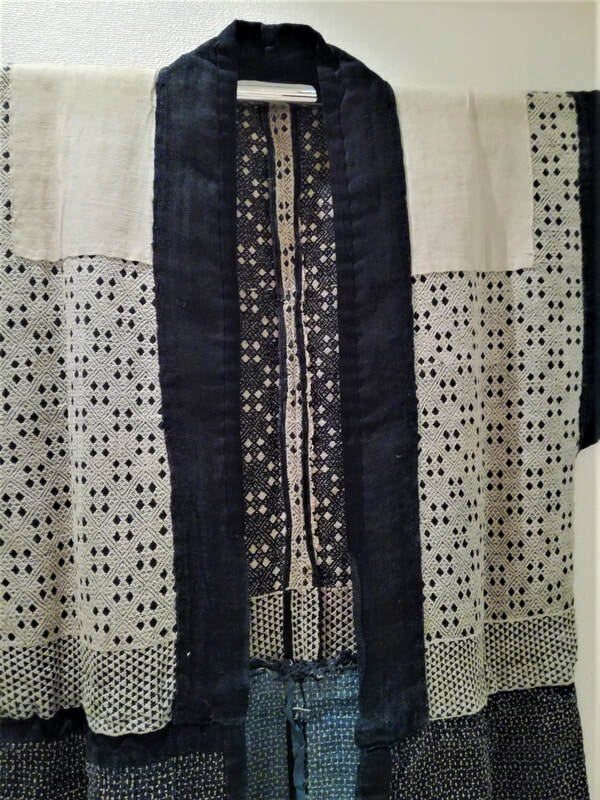 The bags and purses and buttons that it shows how to make are commonly found in other books, but the ideas for ways to incorporate kogin sashi into clothing, are wonderfully fresh and stylish. 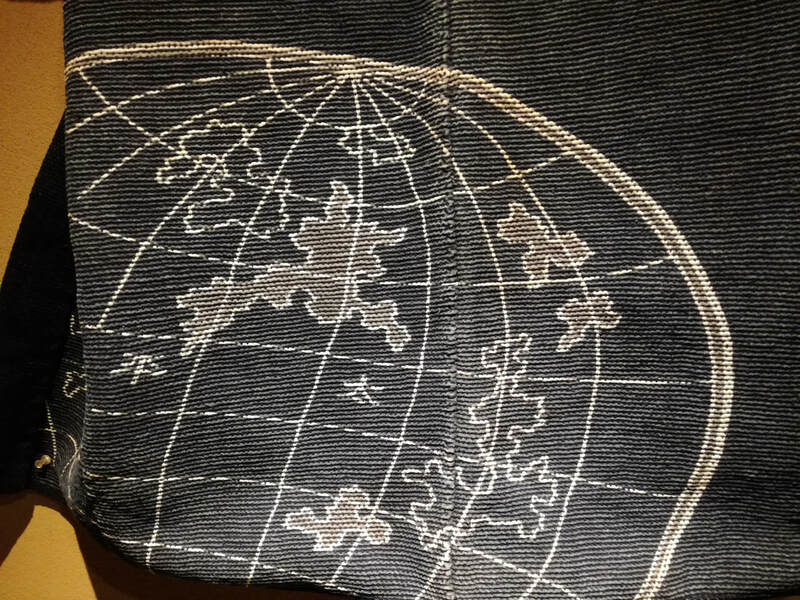 I would love a koginsashi patch on the bottom of my pants as shown in here! The book gets rave reviews on Amazon, and I can see why. Recently I saw an wonderful exhibition of Tsugaru koginzashi kimono from Aomori prefecture at the Amuse Musuem in Asakusa, Tokyo. 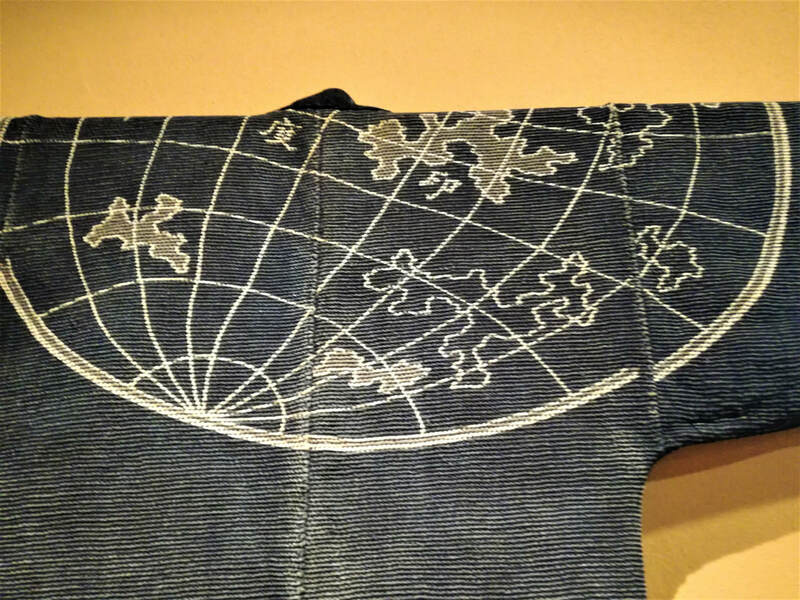 This museum is where textiles from the collection of Chuzaburo Tanaka (1933-2013) are housed. 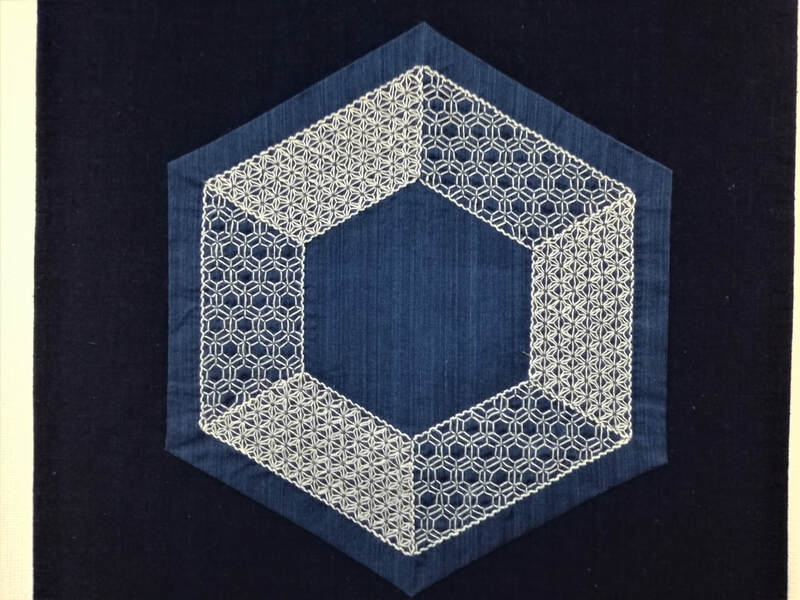 Tanaka was a folklorist researcher from Aomori Prefecture, the northernmost prefecture of Japan where the distinctive form of kogin sashiko was born. 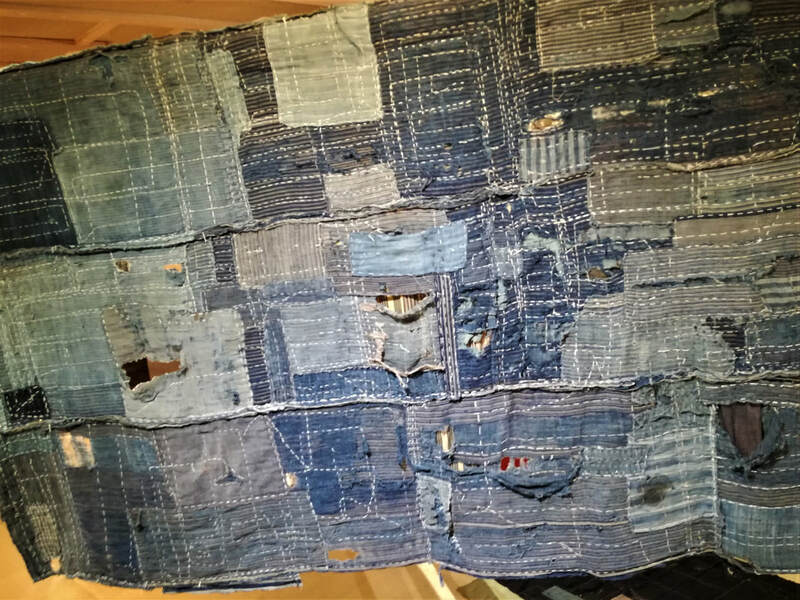 For close on fifty years he researched the life and customs of ordinary people, visiting villages and remote areas to research and talk to elders, and in the course of this he amassed a huge collection of items that told about life in the past. 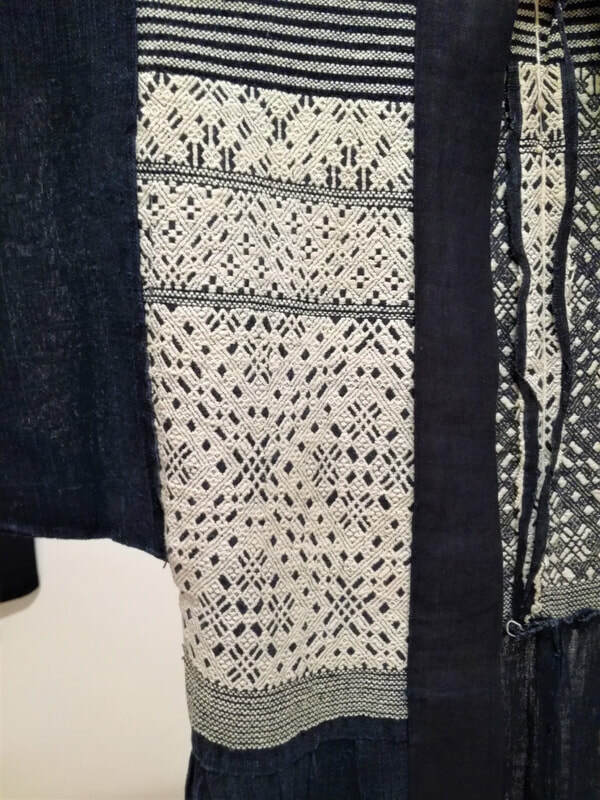 The collection contains 786 items of sashiko clothing that are designated as Important Tangible Folk Cultural Properties by the Japanese government. 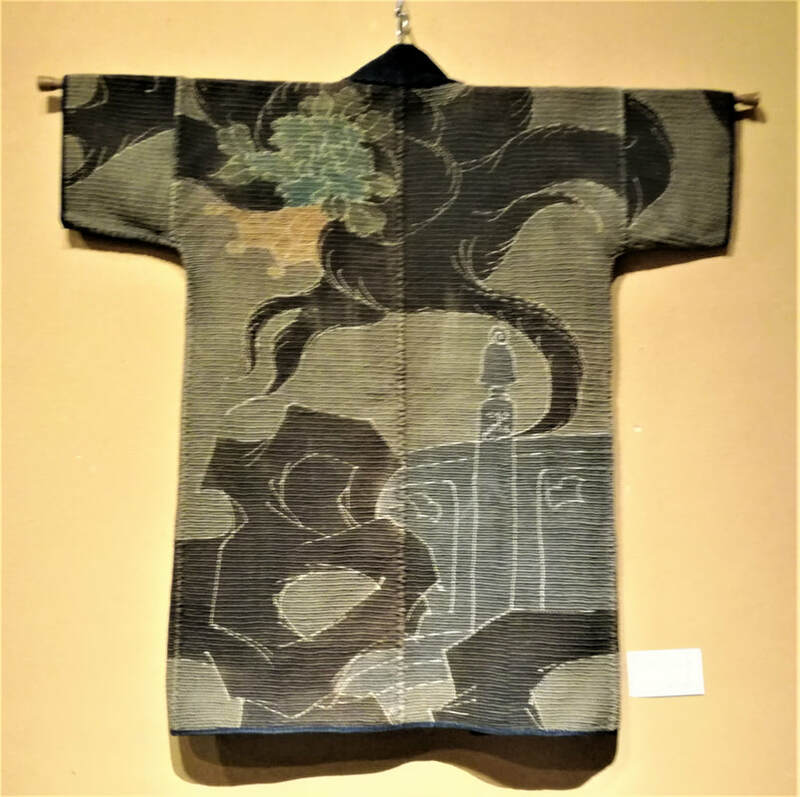 Thirty-three of these are currently on display in this exhibition of Tsugaru koginzashi. 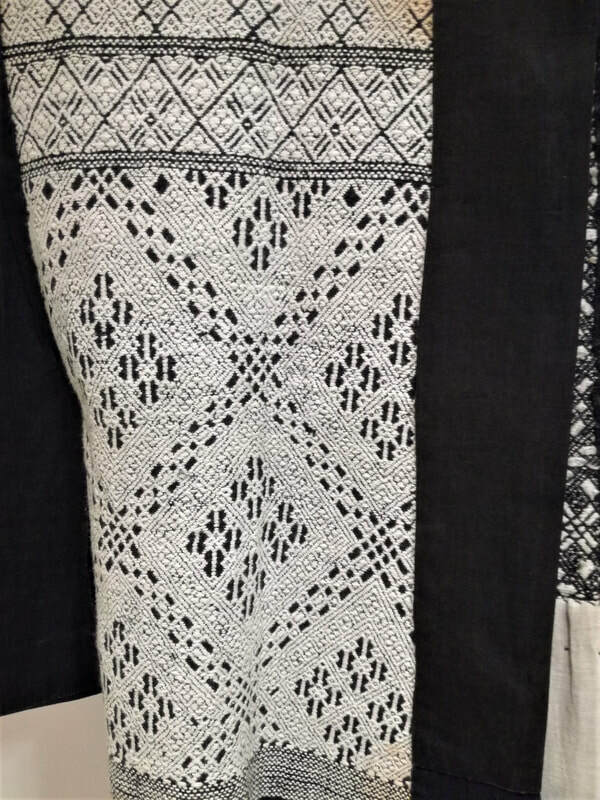 The climate of Aomori is extremely cold, too cold for growing cotton, which is why the common people grew hemp to weave into fabric for making clothing. Everything in fact, from underwear to babies’ nappies and futons, had to be made from hemp. 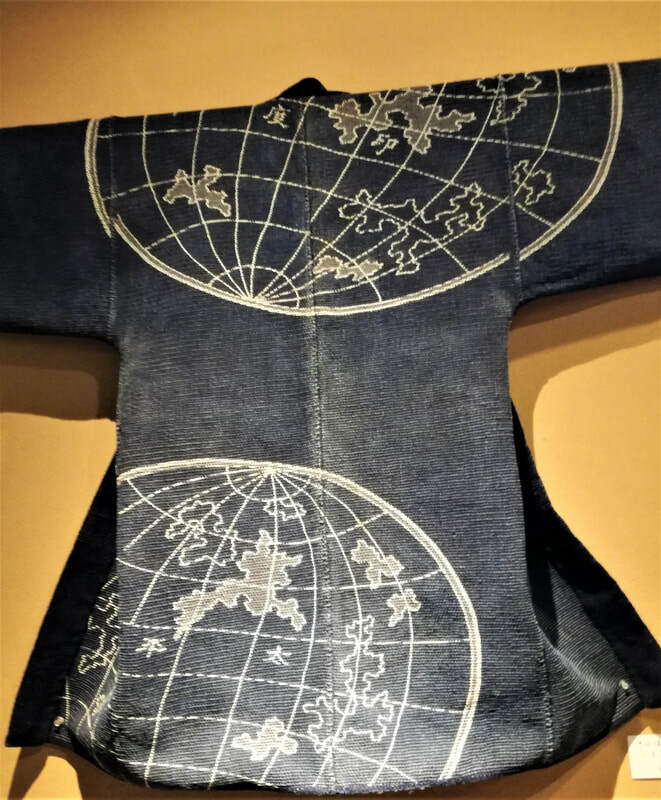 The Tsugaru and Nanbu clans that ruled Aomori forbade common people from using silk or cotton—expensive items that had to be shipped in from other regions—and what’s more forbade them from using more than one layer of fabric to make their clothes. 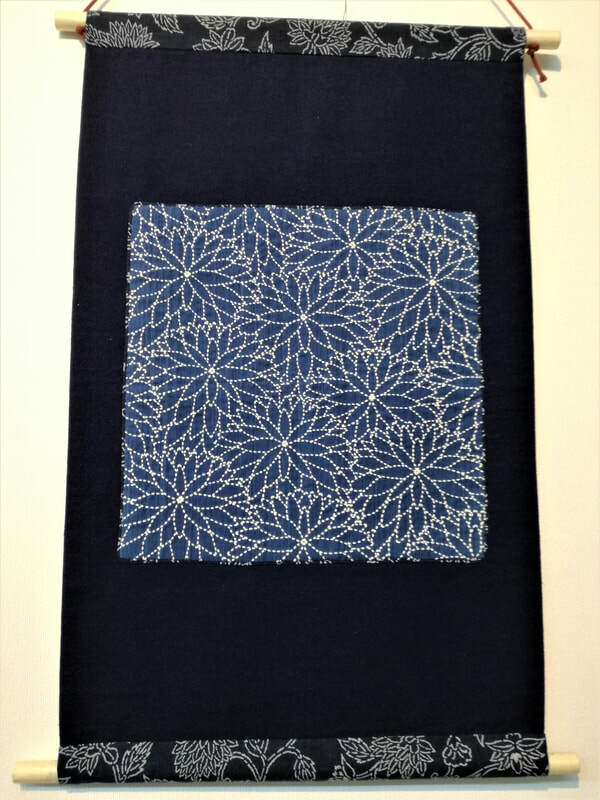 Hence this technique of densely stitched sashiko was born of the necessity to make what little cloth they had at their disposal, as strong and warm as possible. 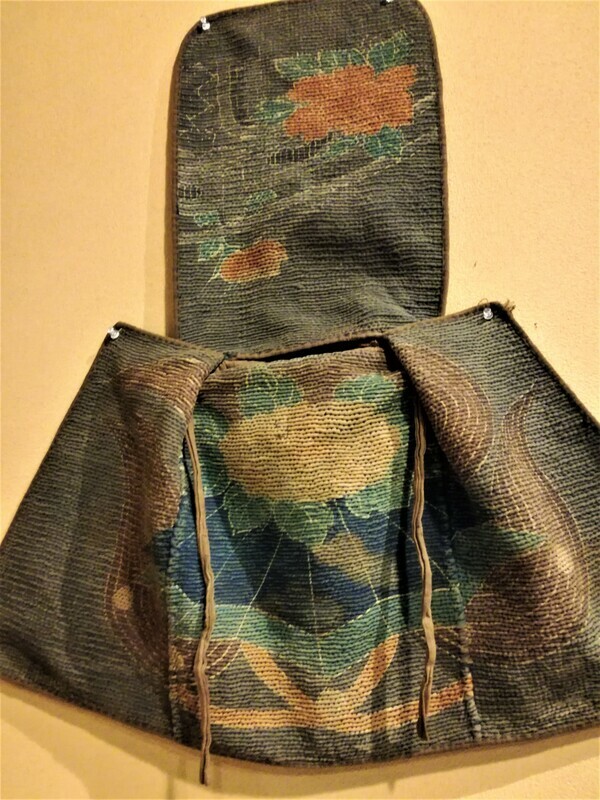 The major difference between Tsugaru kogin sashiko made in the Tsugaru domain (the Japan Sea coast side) and Nanbu Hishizashi from the Nanbu domain (on the Pacific coast side) is the use of colour. 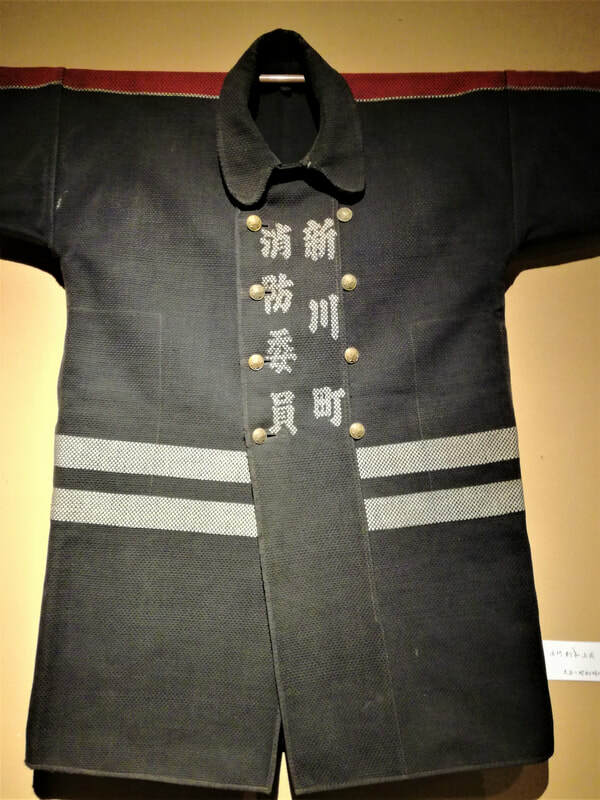 When a railway was extended to the Nanbu area in the late 19th century, coloured thread was brought into the area, and its use permitted by the feudal lord. 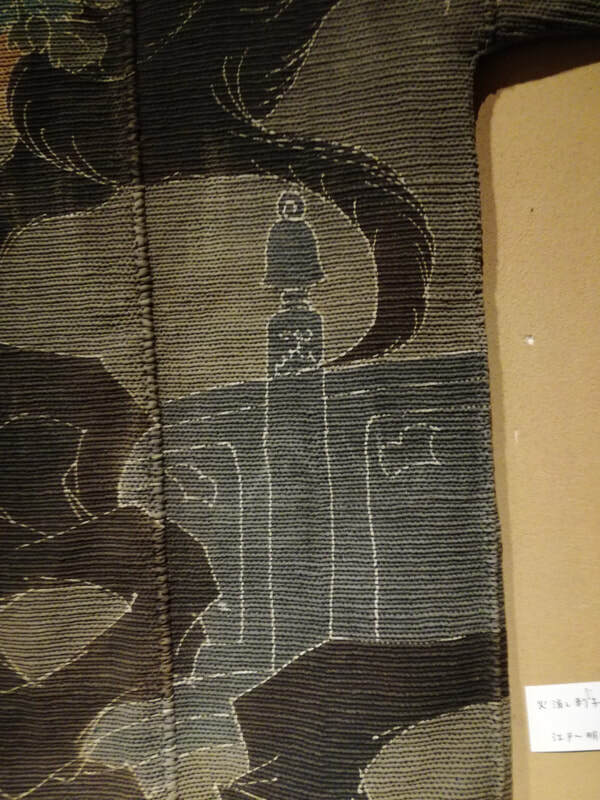 In the Tsugaru domain, however, the lord was a lot stricter and the use of coloured thread was forbidden. This exhibition displays the blue and white sashiko from the Tsugaru region, but from January 29 next year there will be an exhibition of colorful Nanbu sashiko. 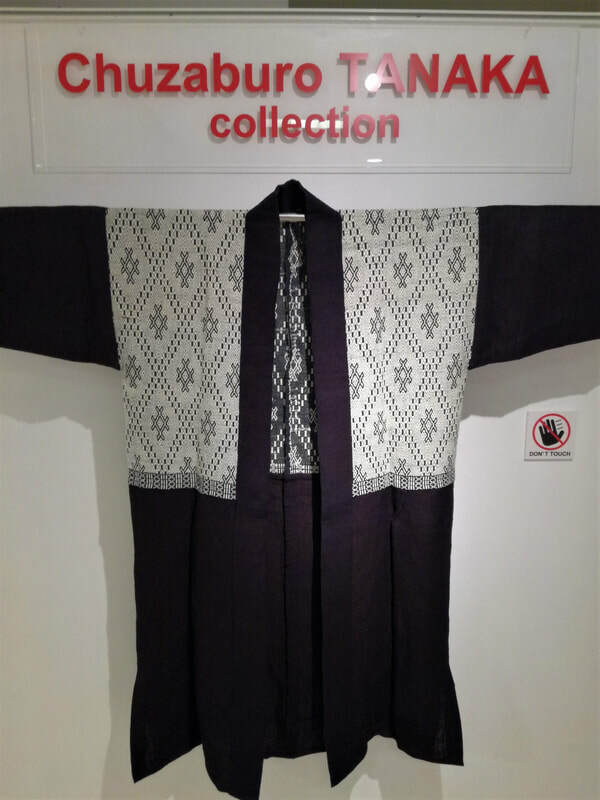 This Tsugaru exhibition is open until September 9th. 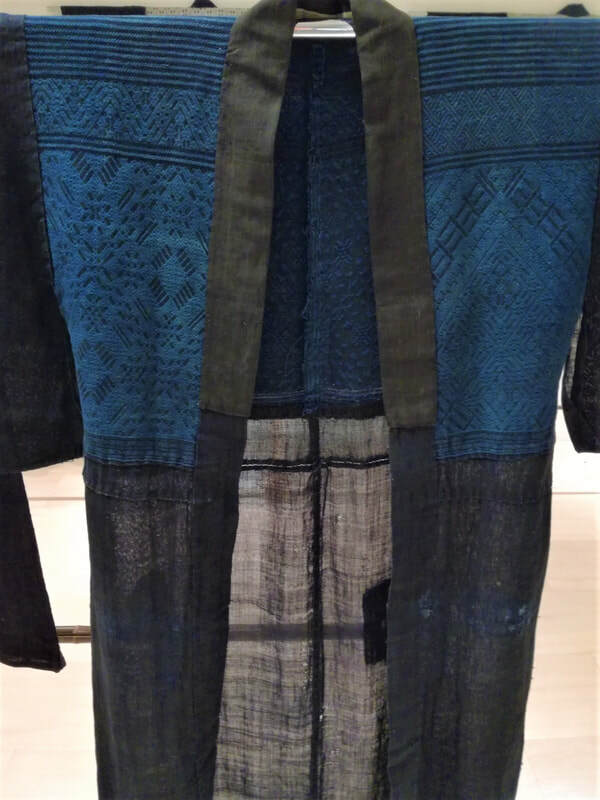 What a contrast these kimono are to our current era of fast clothing! 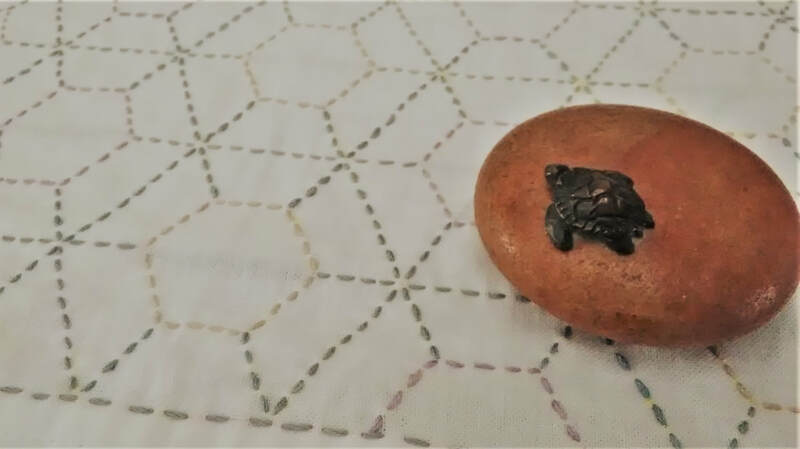 As I walked around looking at each one, I was overcome by the thought of how much time went into making them, and how they were treasured—and still are—for years and even decades after being made. 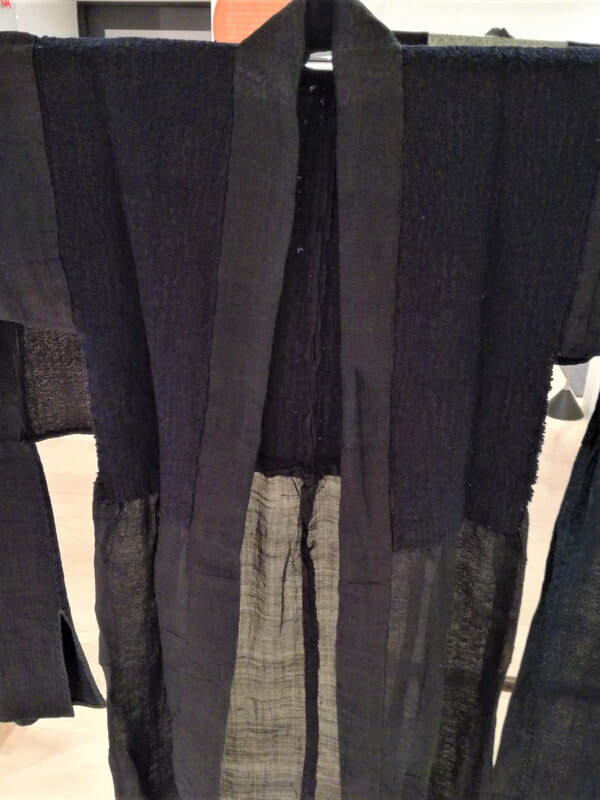 The sleeves on this piece, which was made sometime after WWII, are tapered for ease of movement. 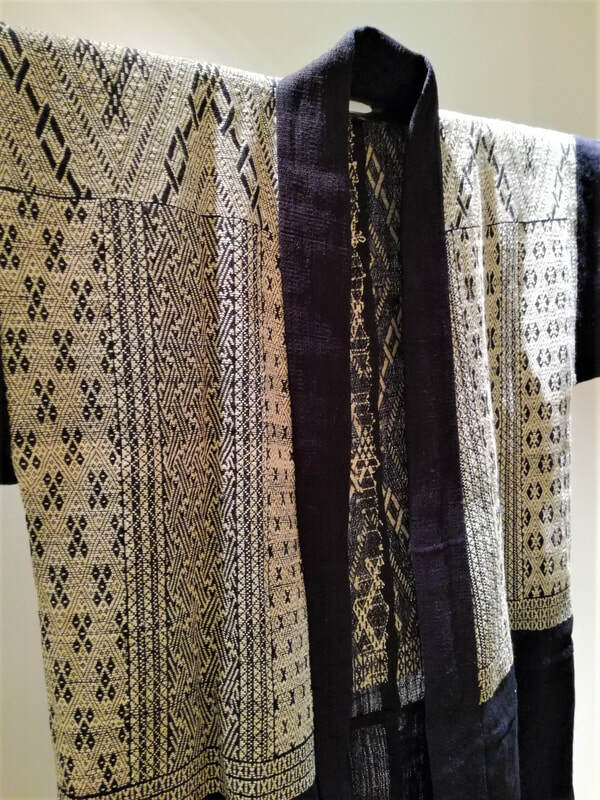 This was the only kimono to be stitched with kogin sashiko on the upper part, and hitomezashi (one stitch sashiko) to strengthen the fabric on the lower section. 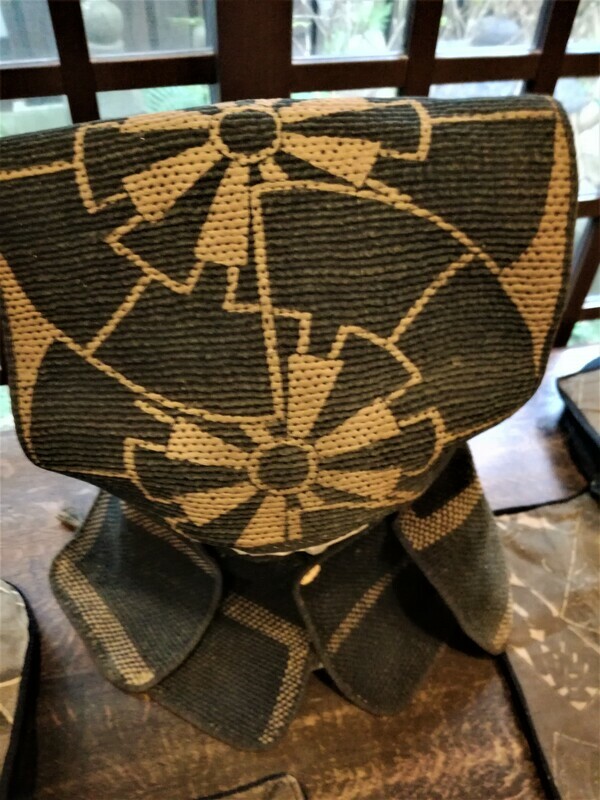 This kimono was worn by a woman from a farming family from Hirosaki. 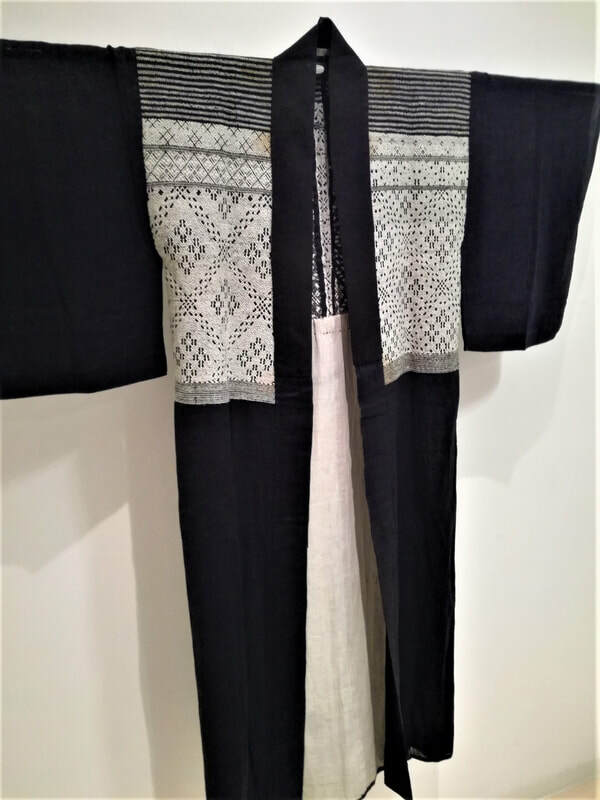 Longer in length than daily working wear, it was made for use on special occasions. 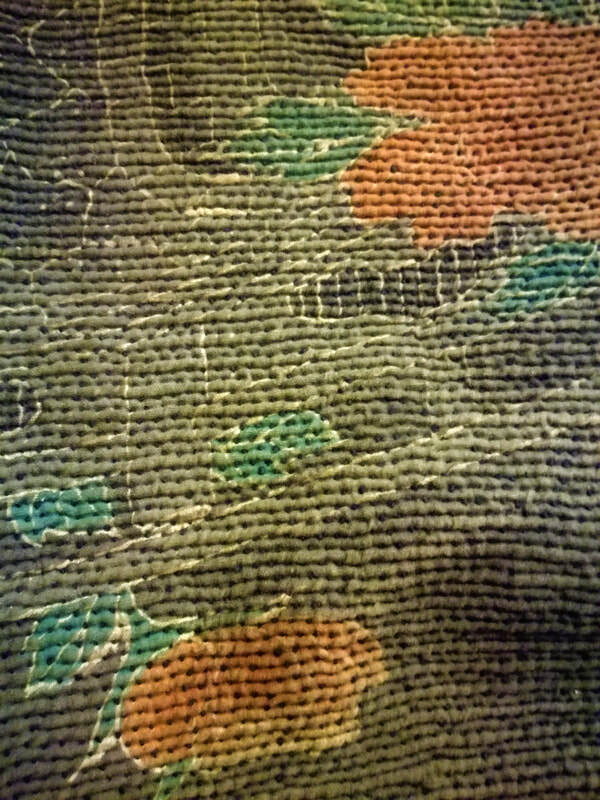 The stitching almost looks like lace! 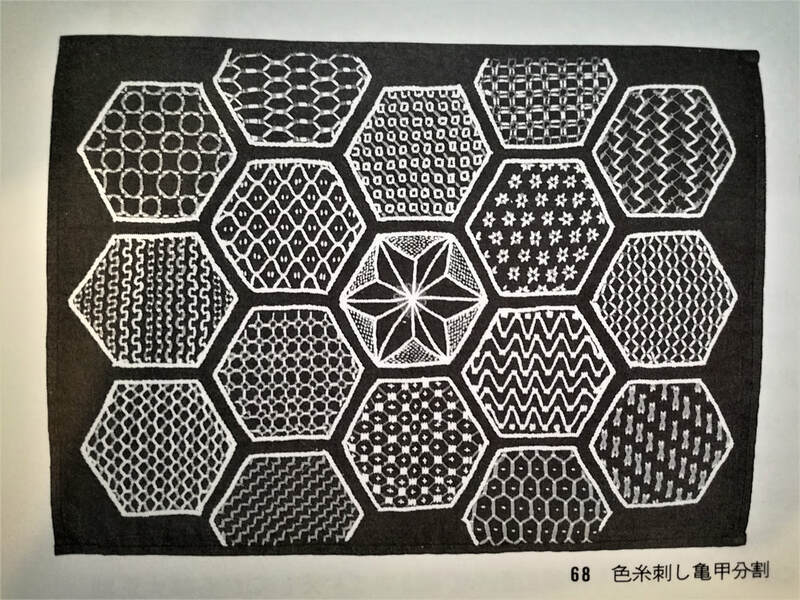 Tsugaru sashiko apparently has more than 200 geometrical patterns. 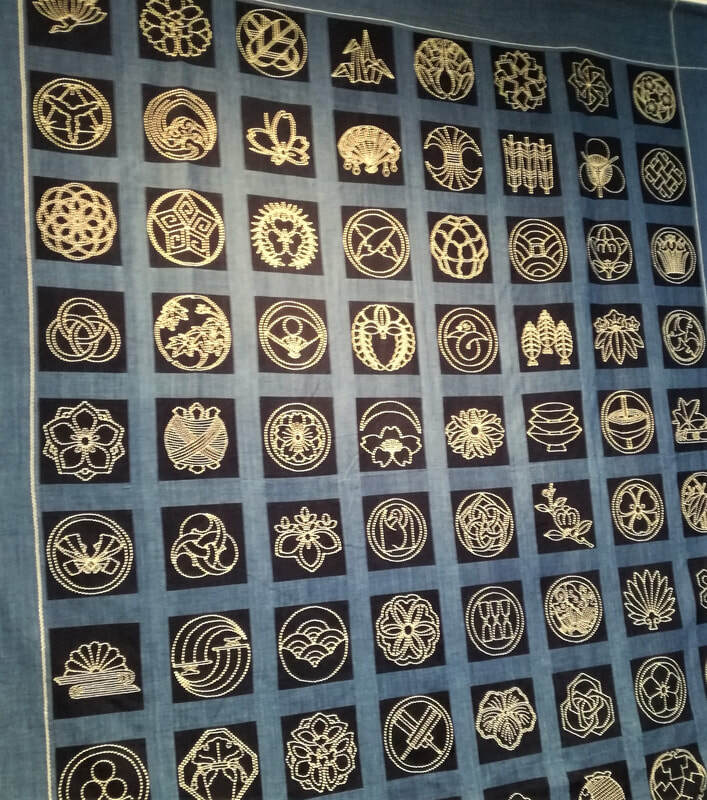 I haven’t done kogin sashiko myself so I’m not familiar with the names of the patterns, but you can see from these photographs how intricate and varied they are. 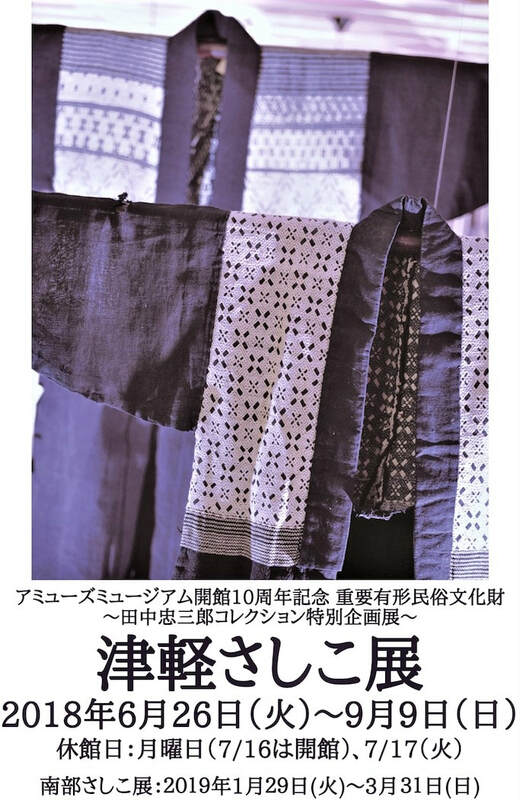 If you happen to be in Asakusa, Tokyo before September 9th, I do recommend this exhibition!. 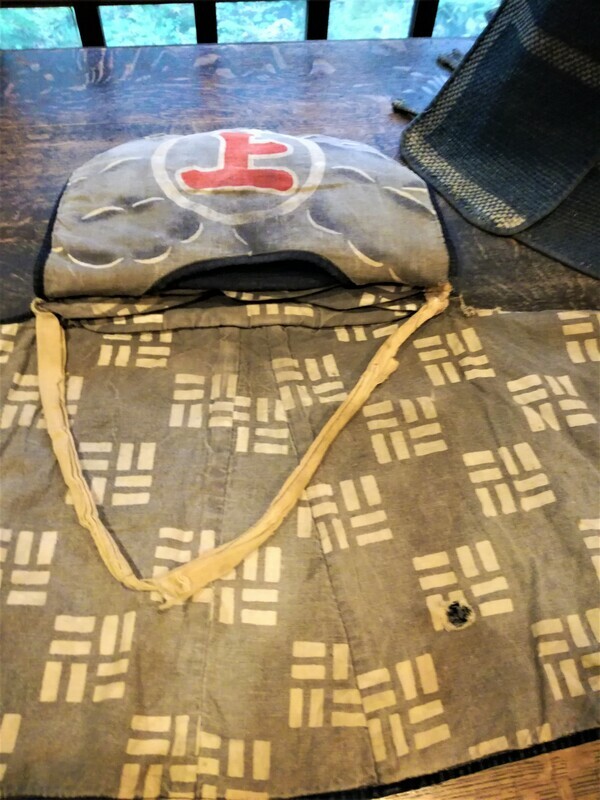 Dear sashikoists and regular readers of this blog. Apologies for my sudden disappearance, but recently I found myself having to put in long, intense hours at the computer in my regular day job as a literary translator, and couldn’t bear to look at it much otherwise. 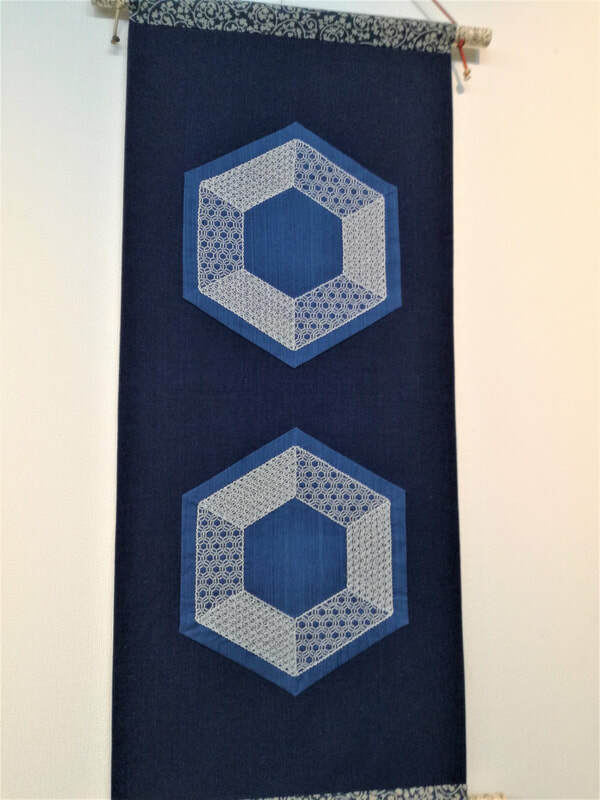 But of course I kept stitching, and once again sashiko helped me get through a difficult period. I’ll tell you more about the projects I’ve been working on in posts to come, but for now I simply want to talk about what jolted me out of my slump – which was soccer. 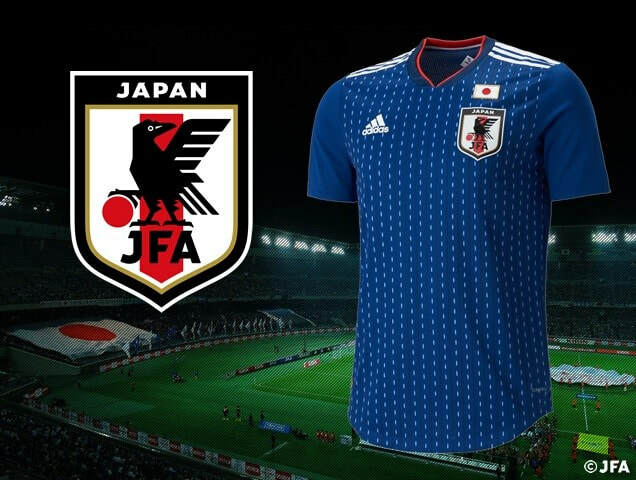 An unlikely topic for this blog, especially as soccer doesn’t actually interest me very much, but there is one compelling reason I’m not averse to watching the Japanese soccer team in action at the World Cup in Russia, and that is their uniforms! 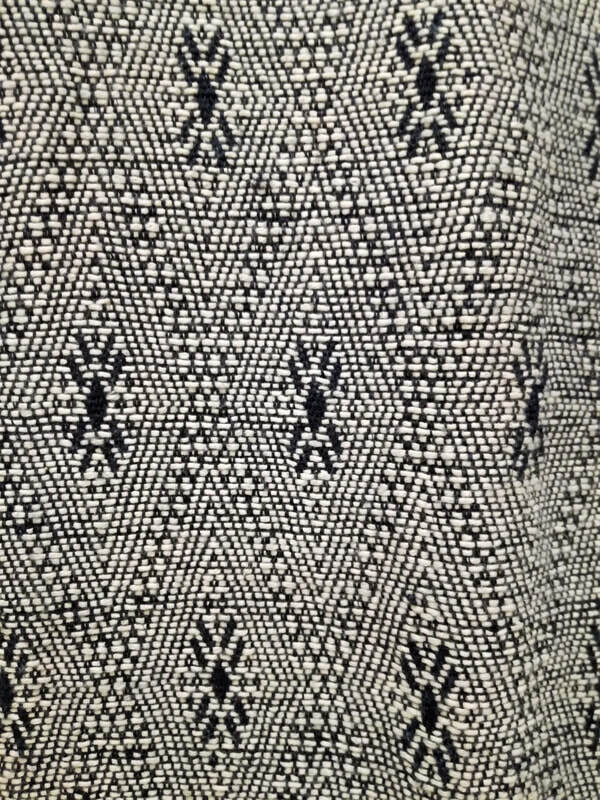 Every time I glimpse the broken parallel lines of the sashiko design on the players' shirts, my heart skips a beat. Regular readers may recall that I mentioned the announcement of this design for the team's new uniform in a post last November. 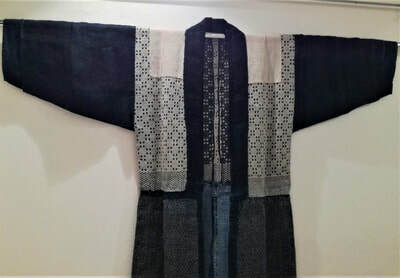 Deep indigo blue has a long tradition and history in Japan, but the reason for its use in the design concept of these shirts, is because 15th and 16th century samurai commanders used to wear kimono of this shade under their armour, hence the idea of its use as a 'winning colour' for the base colour design of the uniform. 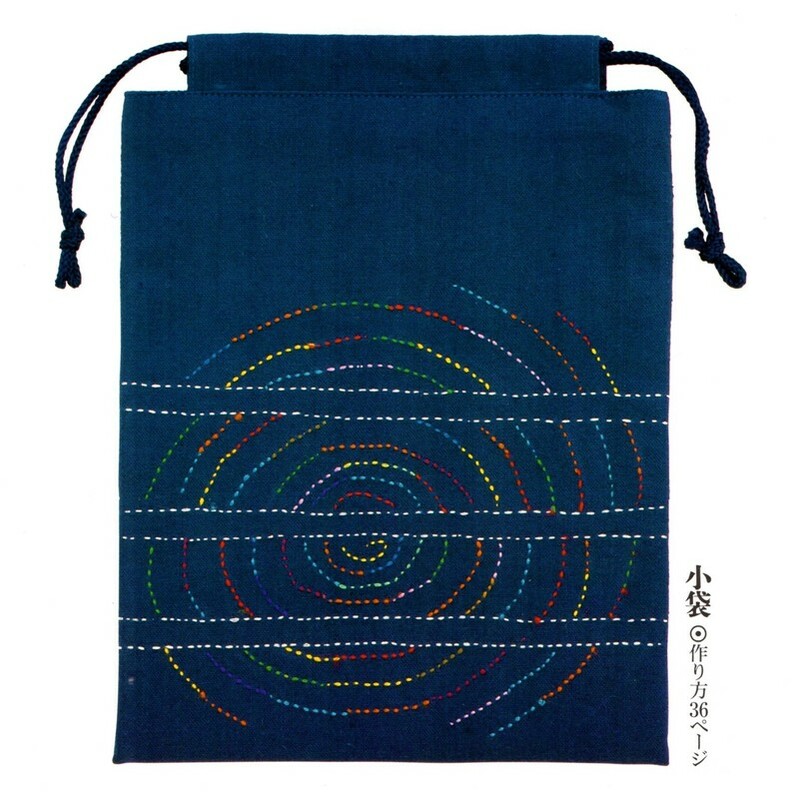 Add to this the sashiko pattern, which represents connecting up the threads of history to mark the twentieth anniversary since Japan first debuted in the French World Cup in 1998, and you have a winning combination. The strategy certainly worked, because on Wednesday June 20, the Japanese team made history by winning their first match in the tournament, beating the favourite in their group, Colombia, by 2 to 1. It was also the first time an Asian team had defeated a South American team in the men’s World Cup. In this case a win for the Japanese soccer is also a win for Watts Sashiko, because it has inspired me to get writing again.